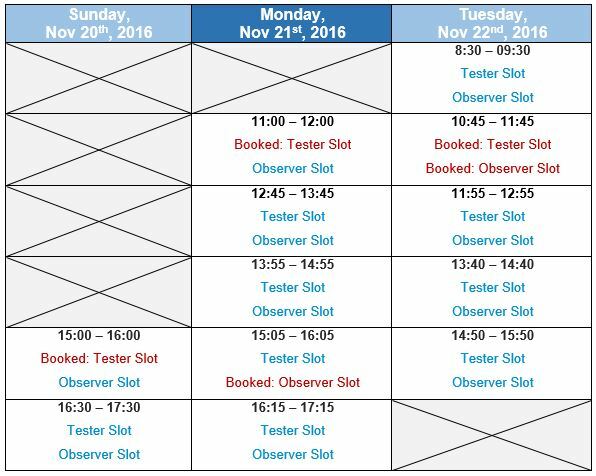 This is the last SAP Screen Personas usability test of this year, and you can participate if you are attending UKISUG in Birmingham, UK from November 20 to 22, 2016! Secure a 60 minutes test session and give us your honest feedback. Test the extended SAP Fiori–inspired template gallery in SAP Screen Personas 3.0 and brand new features. During the usability test, you will simplify screens and work with the new template gallery, based on a test script. Help us improve the product! “Topic 5: SAP Screen Personas”, and secure a seat for your personal test experience. Test slots always fill up quickly so do not let this opportunity pass you by, sign up today! If you have questions about registration or usability testing in general, please send an email to mailto:usability.testcenter@sap.com. Looking forward to seeing you onsite in Birmingham, UK! And if you still want to learn more, visit the Hands-on introduction to SAP Screen Personas on Sunday from 14:30 to 16:00, and from 16:30 to 18:00 by Steve Rumsby and Holly Evans, both University of Warwick, UK. These usability testing sessions are really interesting, even if you know Personas already, and SAP do make good use of the results to improve the product so come along if you can. Dear Steve, Yes, I just saw my mistake that your session is a double-one, and corrected it! And yes again, Steve, I will be there! See you then!